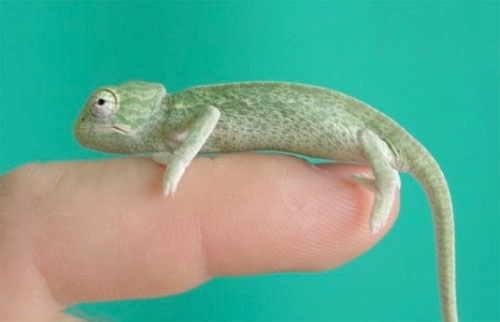 The African chameleon is a rather poorly researched species of the chameleons in captivity. The specimens that I have had the opportunity to work with originates from a very small and imperilled population of the African chameleons that was discovered in Greece a few years ago. 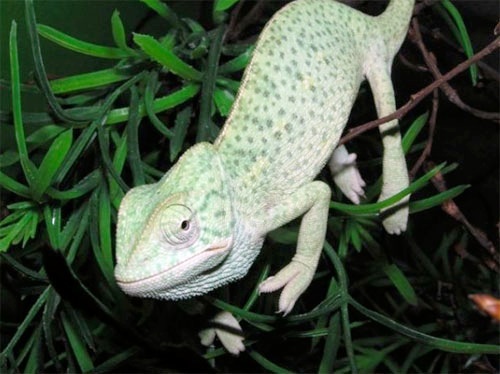 In this article I want to describe my good and bad results in breeding of the African chameleons in captivity. The African chameleon, Chamaeleo africanus LAURENTI, 1768, is a medium-sized chameleon. It reaches approx. 30 cm maximum length (Necas 2004), however other sources say that a female can reache 37 cm and a male 39 cm of the total length (W. Schmidt, K. Tamm, E. Wallikevitz, 1996). 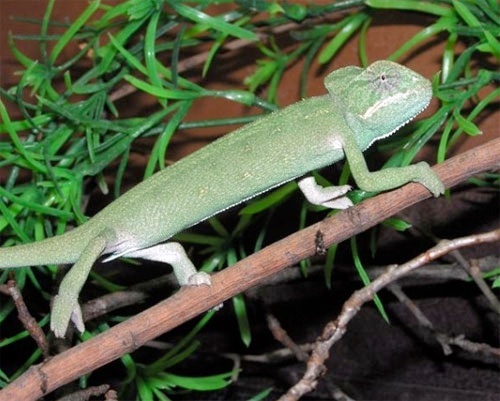 The males from the European population of the African chameleons can reach 55 cm length (pers. obs.) and some males can even exceed the length of 65 cm (Bonetti, pers. comm.). This species is very similar to the Mediterranean species Chamaeleo chamaeleon, the common chameleon (European chameleon). The African chameleon has a larger casque and its occipital lobes have not developed. The skin is homogeneously scaled. Males have a protrusion or “spur” on their hind heels - similar to the males of the cognate but well-known species Chamaeleo calyptratus. Males differ from females by this protrusion or “spur”. Colour of the male and female’s body is green, yellow or grey depending on the external circumstances and mood. During pregnancy, the female’s turquoise-blue body gets yellow stripes and points. 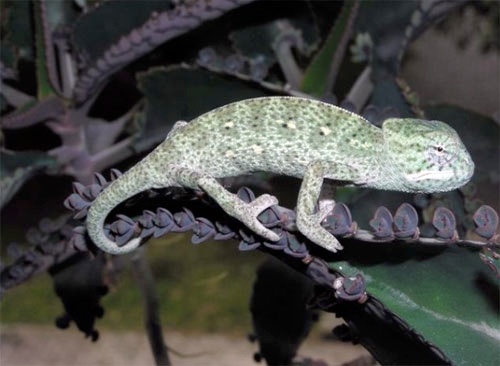 The African chameleon is distributed through Africa in Nigeria and Libya in the west, to Ethiopia and Somalia in the east, and in Sudan, Libya and Egypt (even in the Nile’s basin) in the northeast. In 1998, Böhme, Bonetti and Chiras found the population of the African chameleon on Peloponnesus in Greece. I originally got a pair of these chameleons from a friend - a hobbyist who got them from an acquaintance who had bought them at the market during his vacation in Greece. Since he did not have a terrarium and he did not know how to take care of them, he gave them to his friend. This pair came to me in July 2001. Knowing that common chameleons, Chamaeleo chamaeleon, live in Europe, I first thought that the chameleons were specimens of this species. 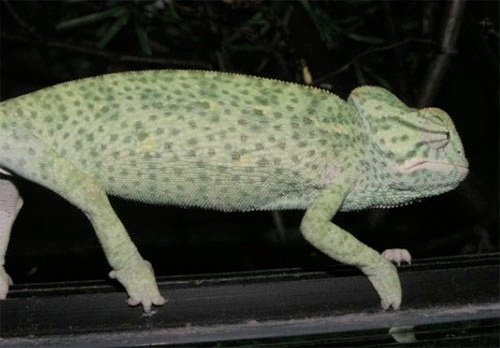 However, after studying the photographs, I found out that the chameleons were African chameleons, Chamaeleo africanus, from a small population discovered in Greece as late as 1998. Thankfully, they were in good condition and each was examined and medically treated against parasites. I put the chameleons into a big outdoor terrarium (length 150 cm, width 100 cm, height 200 cm). The terrarium was densely planted with plants. The chameleons were exposed to sun all day in addition to having access to shade. 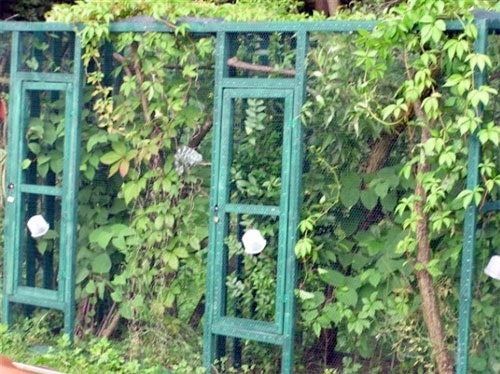 The terrarium was made up by a green plastic mesh that had small (13 x 13 mm) holes. I also fixed an automatic water sprinkler, in addition to spraying the chameleons manually. The chameleons had a good appetite. They were eating crickets, mealworms, zophobas, grasshoppers and cockroaches. They themselves were catching wild insects inside the terrarium. I did not notice aggressive behaviour with them living together. In central Europe, the night temperatures in September fall below 10 ºC and in the daytime, they do not exceed 20 ºC. Therefore I moved the African chameleons into a terrarium inside the house. The terrarium dimensions were 100 x 70 x 200 cm. In the beginning the day temperatures were above 20 ºC, or higher under heat lamps. At night the temperature fell to 17 - 19 ºC. Such temperatures prevailed for the first 45 days. The following 3 to 4 months were colder: 17 ºC during the day, higher under lamps, and from 13 to 15 ºC at night. I reached such temperatures by means of gradual lowering of the temperature, however, at the end of the cold period I was raising the temperature gradually. The terrarium is lit by three fluorescent lights, 120 cm long, and by one 60 W floodlight. 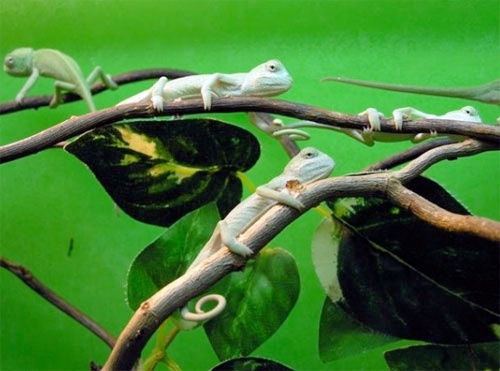 Two of the fluorescent lights are designed to have the full spectrum of day light, and the third light is designed specially for reptiles since it radiates the required UVA and UVB rays. The lights are on 12 hours per day. Since the terrarium was not equipped with an automatic watering/sprinkling system I was spraying it manually and thus watered the chameleons every second day. The chameleons ate less food in winter than in summer. Increased appetite was noticed before and during the female’s pregnancy. In the summertime I did not feed the chameleons with additional vitamins and minerals. During the winter I fed them with NEKTON - MSA or KORVIMIN ZVT once a week. Once they got used to life in captivity, I noticed in the beginning of September 2001 that they were mating. The mating period lasted for several days. In the beginning, the female did not express aggression towards the male although colour of her body changed from green to blue, with yellow blurs and spots all over her body. The female’s appetite increased and she basked more often as well. At the end of September I moved the chameleons inside the house and put them into the indoor terrarium. On 15 October 2001 the female laid 28 eggs in a flowerpot with a rubber plant. The eggs’ dimensions were 16.3-17.6 mm x 10.4-11.3 mm (length x width). All the eggs seemed to be fertilized. I put them in a container with the vermiculite buried to half of their size. The vermiculite was moistened by water in the weight ratio 1:0.5 (1 part vermiculite: 0.5 part water by weight). Since I did not know much about the proper incubation, in the first two months the eggs were incubated at the room temperature 23 ºC to 25 ºC, then four months at the lower temperature 16 ºC to 18ºC, and then again at the temperature 23 ºC to 25 ºC. Based on this method of incubation, 11 juveniles hatched out of 28 eggs on 12 September 2002. The other eggs died during the incubation period. Table 1: Data for egg clutches and hatch dates are given for all three clutches. Note that incubation time is almost the same time. The next two clutches in 2002 and 2003 were incubated under different conditions. I was studying the meteorological features of the African chameleon’s habitat in Greece. I adjusted the incubation temperatures to those in Greece. In Semptember and October the eggs were incubated at the temperature from 23 ºC to 25 ºC, then I decreased the temperature to 16 ºC to 18 ºC for the period of two months, then again the temperature was decreased to 13 ºC to 15 ºC for the period of January and February, however it can be decreased to even 10 ºC. Then I gradually increased the temperature up to 16 ºC to 18 ºC for March and April and then up to 23 ºC to 25 ºC for the last couple months of the approximately 11 month incubation period. However, the temperature was higher in the last two months, i.e. 27 ºC. The incubation itself was successful under such conditions and circumstances. The juveniles were big and healthy. There more females than males were born. Table 2: Reproductive data and remarks. 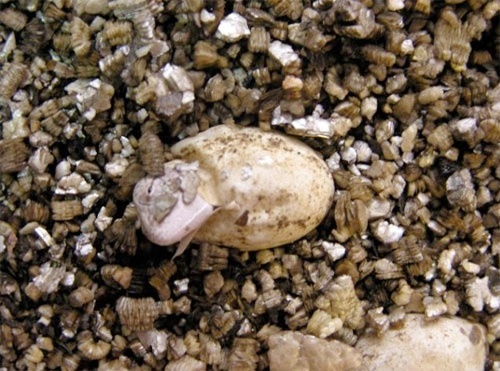 The reason for a high number of dead juveniles on 10 August 2003 lies in a fact that the eggs were (in all their size) buried completely in the sand that served as the incubation material. There was too little air in the container since the sand occupied almost the total volume of the container. The first and the second clutch were incubated in the vermiculit. During my absence (until 10 August 2003), my friend took care of the eggs. He forgot to open the container with eggs in order to allow air in. The quantity of sand in the incubation container, the lack of air and the human mistake caused the death of so many juveniles. After the hatching I put the juveniles in the terrarium of the size 80x40x40 (lxwxh). I usually use such a terrarium for the juveniles of different species. The terrarium is composed of glass with a sliding door. On the front side under the sliding door there is an opening, 3 cm wide, which is spread over the whole length of the terrarium. The opening is covered by a dense rustless mesh preventing fruit flies and micro crickets from getting through. The terrarium lid is also covered by the same mesh thus enabling air flow and preventing the insects from escaping. There is a 60-cm long fluorescent light (designed for reptiles) on the top of the terrarium. Small branches, plastic plants and artificial green grass are used for decoration. It is easy to keep such a terrarium clean and to disinfect it. I put up to 30 juveniles from the same clutch in these terrariums. They can spend the first three weeks to one month like this. I sprayed the juveniles and the decoration 2 to 3 times daily. I fed them with micro crickets and fruit flies. I do not use vitamins and minerals in the first three weeks. Later I use minerals twice a week, and vitamins once a week. After one month, I separate the juveniles with regard to their size, and I put them in smaller terrariums 40x30x30 (lxwxh) in groups of seven. I started to feed them with crickets, and not earlier than in the third month I offered them mealworms once a week. In the fourth month I reduced the usage of minerals to once a week. Neonate Chamaeleo africanus in their terrarium. 1.5 month old Chamaeleo africanus. Under such conditions and circumstances, the juveniles from the first clutch that hatched on 12 September 2002 developed very well in the first two months, however certain troubles appeared later on. Some of the juveniles swelled up round their necks (swollen thyroid gland). They could not catch for food, and finally they died. 2 month old Chamaeleo africanus. The same problems appeared also by the second clutch hatched on 10 August 2003, again in the second month of the juveniles’ age. They were treated in the similar way like those from the first clutch. I used minerals only once a week. The thyroid gland disease was even more frequent in this group. Obviously something was missing in the nutrition of the juveniles. Since I was using less minerals in the second group, and the problem escalated and/or was more frequent as in the first group. I concluded that a certain element was missing in the juveniles’ nutrition. The thyroid gland and digestion did not function properly. I consulted hobbyists and veterinarians, unfortunately nobody could advise me a solution. In summer 2004, Dr. Peter Kodym sent me a copy of an article dealing with Chamaeleolis barbatus: the beardet snail-eater from the Pearl of the Antilles, TERRARISTA Vol. 6, 2002. In the article I found very interesting information on hypertrophy of the thyroid gland when potassium iodide as a preventive medicine should be used twice a month. Potassium iodide is to be added to drinking water in the ratio 100 mg / 1 l water. Dr. Peter Kodym states that the Chamaeleolis like to eat snails with shells and live on a limestone substrate in the wild. Also the African chameleons in Greece live on a limestone substrate, and there are many snails with shells as well. Finally I knew what the problem was: the increased need of potassium iodide and other elements. The African chameleons live in Greece in the narrow zone on the seaside grown with macchia, Mediterranean evergreen shrubbery, covered by layers of sea salts. Different chemical elements including iodine become part of the chameleons’ food by means of insects and also through the dew the chameleons are drinking. The question now was: Will this help? Is this a solution? I tested this new solution on the clutch of juveniles hatched on 17 August 2004. I was treating them in the same way as the first clutch, however I was adding potassium iodide (100 mg / 1l H20) to the drinking water, spraying them with this water solution twice a month. There were no more cases of the swollen thyroid gland and indigestion, and no loss of juveniles. When I am writing this article, the juveniles are 5 months old. So far I have not notices any problems with them. All of them are growing and developing, their total length is 13 - 17 cm. 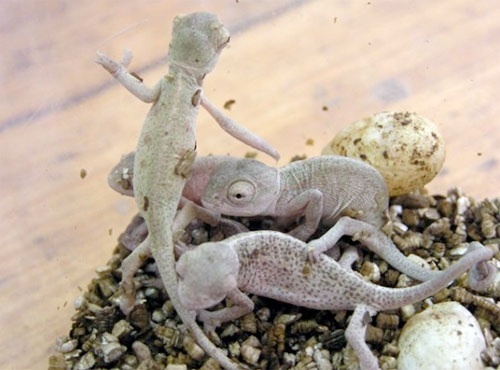 It seems that I have discovered another little secret in the life of the African chameleons. The African chameleon is a beautiful and interesting species of chameleon. In the raising of juveniles, certain problems occurred that would have been painful for every breeder, the loss of the long time expected juveniles. Circumstances helped me to solve the problem. I hope that the usage of potassium iodide in drinking water will prove successful, that it will stop and prevent problems with swollen thyroid gland and secondary problems resulted from it. I do hope that this article will contribute to the further breeding of the African chameleon in captivity. Lutzmann, N. (2000): Chamaeleo africanus LAURENTI, 1768 und der Schutz dieser Art in Griechenland. - Draco, Chamäleon - Natur und Tier - Verlag, 79-80. Necas, P. (2004): Chamäleons - Bunte Juwelen der Natur.- Edition Chimaira, Frankfurt am Main: 382 S.
Schmidt, W., K. Tamm & E. Wallikewitz (1996): Chamäleons. Drachen unserer Zeit.- Natur und Tier - Verlag, Münster, 160 S.
Trapp, B. (2004): Gute Nachrichten von greichischen Chamäleons.- Elaphe 12(2): 50-54.